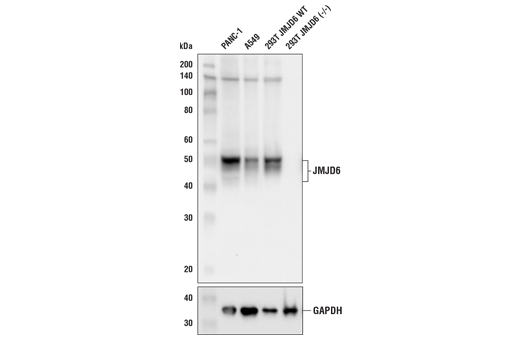 JMJD6 (D3O3N) Rabbit mAb recognizes endogenous levels of total JMJD6 protein. Monoclonal antibody is produced by immunizing animals with recombinant protein specific to the amino terminus of human JMJD6 protein. Western blot analysis of extracts from PANC-1, A549, and 293T (JMJD6 WT and KO) cell lines using JMJD6 (D3O3N) Rabbit mAb (upper) and GAPDH (D16H11) XP® Rabbit mAb #5174 (lower). 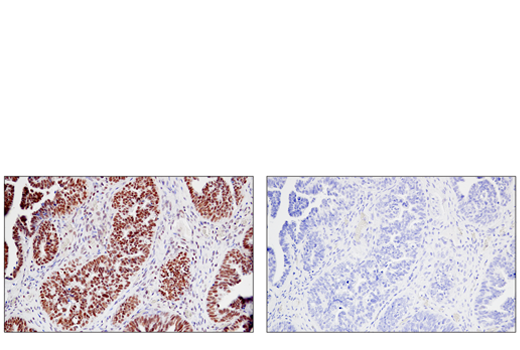 Immunohistochemical analysis of paraffin-embedded human colon carcinoma using JMJD6 (D3O3N) Rabbit mAb. 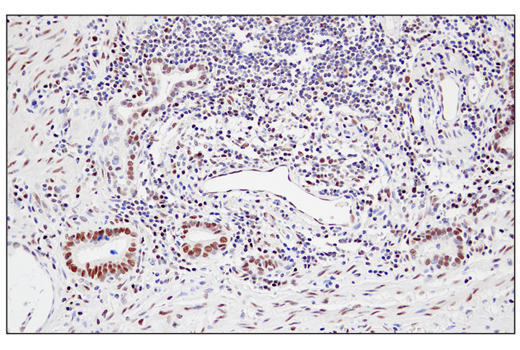 Immunohistochemical analysis of paraffin-embedded human esophageal carcinoma using JMJD6 (D3O3N) Rabbit mAb. 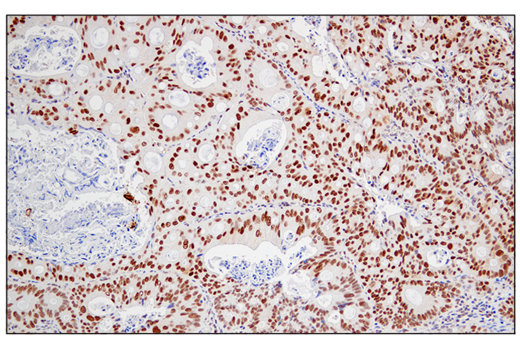 Immunohistochemical analysis of paraffin-embedded human lung adenocarcinoma using JMJD6 (D3O3N) Rabbit mAb. 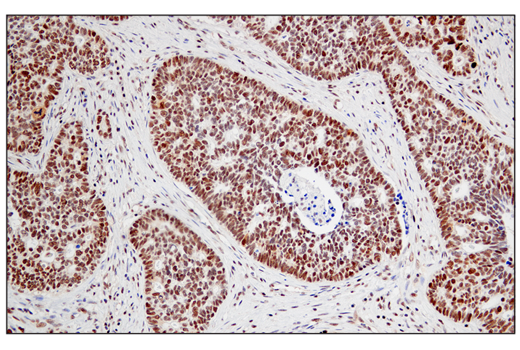 Immunohistochemical analysis of paraffin-embedded human serous papillary carcinoma of the ovary using JMJD6 (D3O3N) Rabbit mAb (left) compared to concentration matched Rabbit (DA1E) mAb IgG XP® Isotype Control #3900 (right). 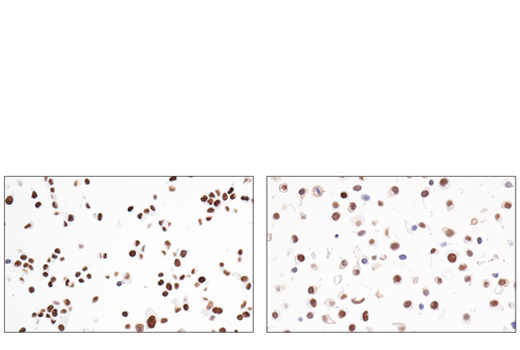 Immunohistochemical analysis of paraffin-embedded HCT 116 cell pellet (left, high-expressing) or KYSE-70 cell pellet (right, low-expressing) using JMJD6 (D3O3N) Rabbit mAb. 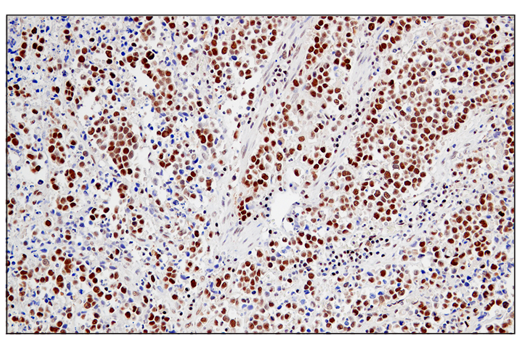 Immunohistochemical analysis of paraffin-embedded human gastric carcinoma using JMJD6 (D3O3N) Rabbit mAb. Jumonji domain-containing protein 6 (JMJD6) is a bifunctional metalloenzyme belonging to the large family of JmjC domain-containing proteins. These proteins are ferrous iron- and 2-oxoglutarate-dependent enzymes (Fe2+/2OG) that catalyze hydroxylation and demethylation reactions on a wide variety of protein and nucleic acid substrates (1). JMJD6 is thought to act as both a lysyl-hydroxylase and an arginine demethylase, although the latter activity remains controversial. Specifically, JMJD6 has been shown to catalyze 5-hydroxylation of Lys15 and Lys276 residues on the protein U2AF2 / U2AF65 in vivo, affecting pre-mRNA splicing activity (2). It has also been reported that JMJD6 hydroxylates the Lys382 residue of p53, preventing acetylation and promoting association of p53 with MDMX, resulting in inhibition of p53 transcriptional activity (3). In addition to hydroxylase activity, JMJD6 also acts as an arginine demethylase by targeting histone H3 at Arg2 (H3R2me) and histone H4 at Arg3 (H4R3me). Unlike other members of the JmjC family, JMJD6 appears to have no lysine demethylase activity (4). Studies have shown that JMJD6 colocalizes with BRD4 at a subset of enhancers to demethylate H3R2me2 repressor marks (5). It has also been reported to demethylate non-histone substrates, such as estrogen receptor (ERα) (6), heat shock protein 70 (HSP70) (7), RNA helicase A (8), and the TRAF6 E3 ubiquitin ligase following activation of toll-like receptors (9). Although mutations in the sequence of JMJD6 have not been observed in cancer, its overexpression is identified in various cancers and is associated with aggressive disease progression and poor prognosis (10). This holds true for certain types of colon (3), lung (11), and breast cancers (12, 13). Based on these findings, JMJD6 has drawn interest as a potential therapeutic target and biomarker for certain cancer types. Kwok, J. et al. (2017) Front Genet 8, 32. Webby, C.J. et al. (2009) Science 325, 90-3. Wang, F. et al. (2014) PLoS Biol 12, e1001819. Hahn, P. et al. (2010) PLoS One 5, e13769. Liu, W. et al. (2013) Cell 155, 1581-95. Poulard, C. et al. (2014) PLoS One 9, e87982. Gao, W.W. et al. (2015) Proc Natl Acad Sci U S A 112, E3327-36. Lawrence, P. et al. (2014) Virology 452-453, 1-11. Tikhanovich, I. et al. (2015) J Biol Chem 290, 22236-49. Vangimalla, S.S. et al. (2017) Biomolecules 7, . Zhang, J. et al. (2013) Tumour Biol 34, 2397-401. Lee, Y.F. et al. (2012) Breast Cancer Res 14, R85. Poulard, C. et al. (2015) PLoS One 10, e0126181.